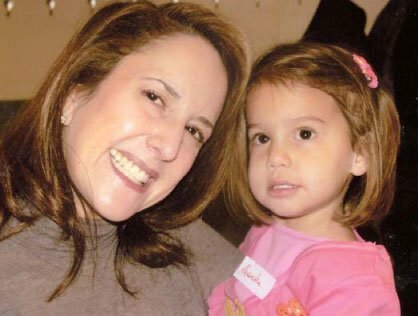 Lisa Gershowitz Flynn, wife and mother of two young children, is urgently seeking a donor match for a bone marrow or stem cell transplant. Lisa was recently diagnosed with Acute Myelogenous Leukemia - AML. This form of cancer is curable but moves very quickly. Unfortunately, the treatments have not put her into full remission and it is now critical for her to have a bone marrow or stem cell transplant. Lisa’s heritage is Eastern European – Ashkenazi - and she has the best chance to match a donor with the same ethnicity. Originally from Long Island, Lisa is 41 years young and lives in New York City with her husband, John, and two children, Michael and Alexandra. What can you do to help? Get an HLA Test. The testing is for genotype (tissue type) and not blood type. Testing only takes a couple of minutes and a buccal swab (a sterile Q-tip which is rubbed along the wall of your inner cheek to collect cells) is used. Following the initial testing, all expenses are paid for by the patient and the patient’s insurance. Bone marrow and stem cell transplants are potentially life-saving treatments for patients with leukemia and other blood diseases. The majority of donations do not involve surgery. The patient's doctor most commonly requests a peripheral blood stem cell (PBSC) donation, which is non-surgical and outpatient. If marrow is requested, it is a minor surgical procedure, usually outpatient. The transplanted healthy stem cells from a donor replace a patient's unhealthy blood cells that have been destroyed by chemotherapy. Donors must be between the ages of 18 and 60 and in good general health. DONATING IS VOLUNTARY. If you join the general bank, you are not obligated to proceed although most of us, if called upon to save someone’s life, would feel compelled to help. Below is information on how to get tested. www.GiftOfLife.org This is an organization dedicated to Eastern-European Jewish ethnicity throughout North America and abroad. The HLA typing kit costs $36 and is tax deductible. They will ask you a few questions and then you will download a form, sign it, put it in the mail and they send out the kit immediately. *IMPORTANT - While you are filling out the on line application, you need to select "YES" to the option “Is your test part of an immediate or extended family study for a specific patient?” You will also need to provide her doctor’s fax number so that the results are sent to him. … - “Lisa Flynn” and doctor - David Araten @ NYU Fax Number 212-731-5540. In Manhattan, contact the NY Blood Bank at 212-570-3441 (310 East 67th Street) and make an appointment for HLA typing ($40). Please let them know the test is for "Lisa Flynn". For Private Testing Tepnel Life Codes (800-915-3695). The kit costs $165. You will need this information for the private testing form. If the cost is a burden, please let us know and we will help.